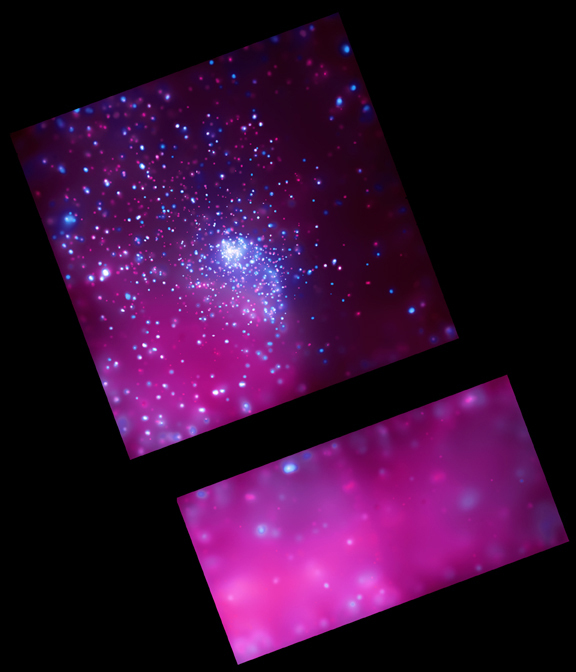 Chandra's image of the star cluster Trumpler 14 shows about 1,600 stars and a diffuse glow from hot multimillion degree X-ray producing gas. The cluster has one of the highest concentrations of massive, luminous stars in the Galaxy. Located on the edge of a giant molecular cloud, it is part of the Carina Complex which contains at least 8 star clusters. The bright stars in Trumpler 14 are young (about 1 million years old), and much more massive than the Sun. They will shine brightly, exhaust their prodigious energy, and explode spectacularly as supernovas in a few million years. In the meantime, the young, massive stars have a profound influence on their environment through the ionizing effects of their light, and the high-speed winds of particles that are pushed away from their surfaces by the intense radiation. Shock waves that develop in these winds can heat gas to millions of degrees Celsius and produce intense X-ray sources. In the accompanying image (below, right), the bright white source in the center of the wide-field image (above) has been resolved to reveal several massive stars. On a larger scale, stellar winds can carve out cavities in the clouds of gas and dust that surround the stars, and trigger the formation of new stars. These cavities are filled with million-degree gas that produce the diffuse X-ray glow in the image. 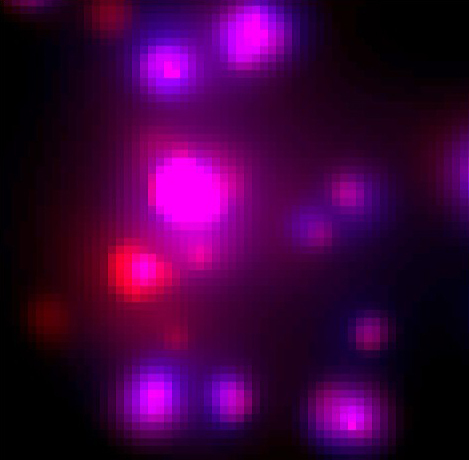 The glow in the lower, rectangular part of the image (the gap between the upper and lower portions of the image is an instrumental artifact) is from a gas cloud that has been enriched with oxygen, neon, silicon and iron. This probably marks the final contribution of a once-bright star that exploded as a supernova thousands of years ago, and in the process dispersed these heavy elements into the interstellar medium. Scale Image is about 18 arcmin across the field of view. Coordinates (J2000) RA 10h 43m 57.50s | Dec -59° 32' 53.00"